Notes: Bolton Castle is a 14th-century castle located near Wensleydale, Yorkshire, England (grid reference SE03379183). The nearby village Castle Bolton takes its name from the castle. The castle is a Grade I listed building and a Scheduled Ancient Monument. The castle was damaged in the English Civil War, but much of it remains. It has never been sold and is still in the ownership of the descendants of the Scrope family. The castle was built between 1378 and 1399 by Richard, 1st Baron Scrope of Bolton, and is an example of a quadrangular castle. The licence to build it was granted in July 1379 and a contract with the mason John Lewyn was made in September 1378. Construction was reputed to cost 18,000 Marks. The 16th century writer John Leland described 'An Astronomical Clock' in the courtyard and how smoke was conveyed from the hearth in the hall through tunnels. 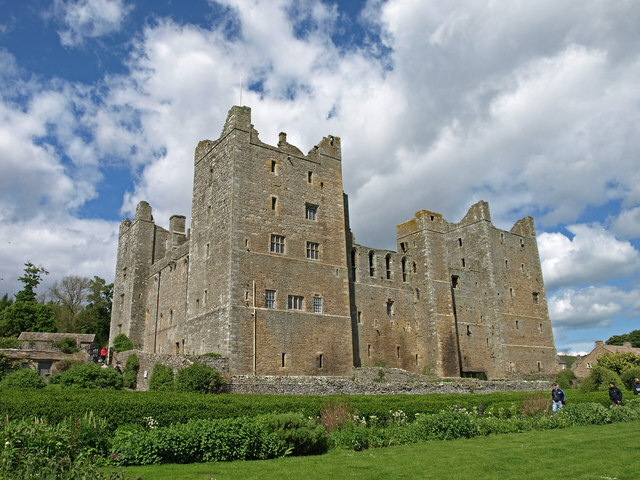 Bolton Castle was described by Sir Francis Knollys as having 'The highest walls of any house he had seen'. In 1536 John, 8th Baron Scrope supported the Pilgrimage of Grace rebellion against the religious reforms of King Henry VIII and gave Adam Sedbar, Abbot of Jervaulx sanctuary in the castle. In consequence John Scrope had to flee to Skipton pursued by the King's men but Abbot Sedbar was caught and executed. In retribution the king ordered Bolton castle to be torched, causing extensive damage. Within a few years the damage had been repaired and Sir John had regained his seat in Parliament.